Happy Holidays! Happy New Year 2011! May 2011 bring you marvelous success and happiness. 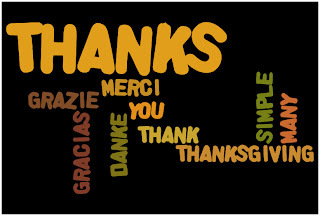 Thank you for subscribing, reading and commenting. You make this great fun and ever so interesting. Imagine a Library with an unforgettable retail experience. More specifically Bibliotheek Almere in the Netherlands. 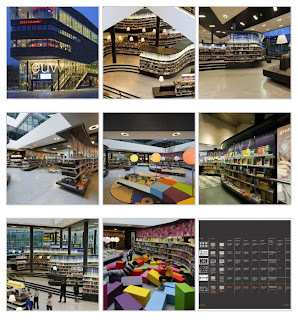 I first learned about Bibliotheek Almere in the August 2010 issue of DDI Magazine. Finally, I thought, a public space that not only recreates the Barnes & Noble vibe, but goes beyond it to create a shoppable public environment where I could see myself spending considerable time! Books are presented to customers with covers displayed rather than the traditional book spine in bookshelves format. The library space is designed for lingering in and offers a "meandering landscape" where seating, lighting, information terminals and workspaces have been integrated into bookshelves. Imagine five levels ranging from bookshelves, Internet areas, a read cafe, study areas and a multimedia area that is so dynamic that monitors project games as they happen and animate the building's exterior facade. Books are arranged not by Dewey Decimal System, but rather by topics relevant to 'customers' and more similar to shops than to traditional libraries. A curvilinear layout means an engaging adventure of discovery that draws visitors in. Here are more details in Almere Library by Concrete Architectural Associates in the Contemporist - hat tip to the Indie Librarian. I think I need a dose of Bibliotheek Almere. In fact, not only would public spaces benefit, but many retail spaces might, too. I'm curious. How might you integrate some of these 'shoppable library' elements into your retail experience? Here is the 12/17/10 issue of Retail Experience in the News... recapping the latest articles and links shared on Twitter with the #retailexp hashtag this past week. This issue may qualify as the 'customer service' focused one given how many interesting & related stories I came across! Love the questions @retailprophet asks in 'we don't need no stinkin badges' http://ow.ly/3pmuZ It's the #retailexp that matters, no? As you can tell from this picture, I have met Paco Underhill, founder of Envirosell, author of What Women Want: The Global Market Turns Female Friendly and accomplished retail experience anthropologist. This wasn't the first time, but it was the first time I had the presence of mind to ask for a photo! 1. Mobile phones and the online world create a multi-channel world for consumers. 2.The economic crisis has acted as an accelerant for customers who are scrabbling to use technology tools to get more out of the money they have available, especially since the fixed costs in our lives - housing and healthcare - are out of our control and continue to increase. 3. Customers see one brand regardless of whether they seek us online or offline. This means that we must be consistent and unified regarless of the medium. Paco Underhill brought up additional retail experience issues. We live in a world designed by men, but intended for women. We face intense time poverty and look for efficiencies online. What is global vs. local? What drives customers globally to a brand? Is it online or is it brick-and-mortar? Given that customers see one brand regardless of the medium through which they interact with retail, it's really important to consistently spend time walking in their shoes offline and online. At the same time, it helps to actively listen to customers - offline and in-store - to understand their world and how they use mobile and digital tools to interact with us. Ideally, as we do this, we are keeping track of the information in some manner that tracks the range of options that customers have for interacting with us... and integrates - or harmonizes - all of those conversations. Check out Time to Harmonize Your Cross-Channel Customer Experience for added perspective. What's your take on this matter? How do you address these customer retail experience issues in your business? How do you track these conversations across different media? Here is the 12/10/10 issue of Retail Experience in the News... recapping the latest articles and links shared on Twitter with the #retailexp hashtag this past week. I was particularly pleased to find several links to consumer trends and women in the marketplace. Note, too, the Twitter & Facebook stats for national retailers. Have you read the NRF Retail's BIG Blog post titled Trendspotting: 11 retailers who do social media right? It's a fascinating glimpse into how eleven retailers - more specifically, Best Buy, Amazon, Zappos, Dell, Nordstrom, Threadless, Starbucks, Dunkin' Donuts, Burberry, Walmart and Loblaw - have not only "embraced ratings and reviews as a proven (online) moneymaker, but ... have taken social applications and outreach further" per Empowered's Josh Bernoff. I wasn't surprised to see most of the retailers listed. I was curious, though, to see how each promoted its social media activity on its website. Several retailer websites share a similar format - with social media presence listed via a link in a footer reference section sometimes above the fold - see Nordstrom, Best Buy, Dell - but also below the fold - see Zappos, Walmart and Threadless. Starbucks prominently features its social media presence, including its last 3 blogposts, on its home page, as you can see from the screen shot above - the only one from this list to do so. Threadless displays its Facebook icon at the top of the page [it now uses Facebook for customer service] as well as in a footer below the fold with Twitter and RSS feeds. A link to its blog is listed under "Info". Burberry offers no sign of its very engaging flash-based Art of the Trench on its website [Note that music plays on both sites.] You'll enjoy spending time there exploring, learning all about the trench and sharing it all with your Facebook friends. 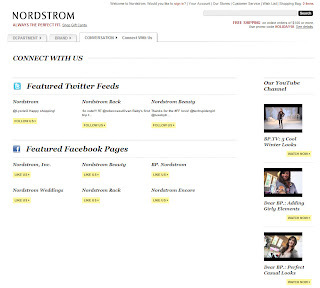 I was surprised to discover that Nordstrom has so many Twitter and Facebook accounts and delighted to notice YouTube videos. To reach this page, you need to click on a cryptic 'connect with us' on the home page. I found no mention of the "popular blog 'threads' referred to in the Trendspotting post, although I did come across a broken RSS feed. Perhaps the missing blog? 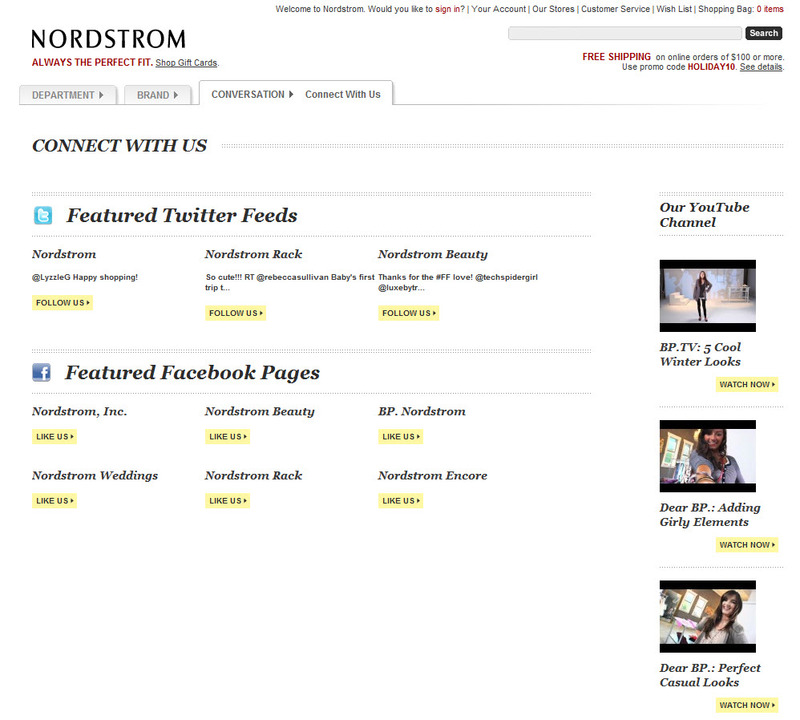 See Nordstrom: Connect With Us. Walmart's social media icons all connect to a page "Values, Tips & Tidbits" listing several Twitter, Facebook and RSS options focused on saving. I was surprised, though, not to see the elevenmoms.com site featured anywhere on the Walmart site despite being an official Walmart Moms' site. Amazon and Loblaw are included in the list because of their ratings and reviews. I applaud what these 11 retailers are doing right with social media. At the same time, I'd love to understand why all retailers - especially those doing social media right - don't visibly flaunt their social media presence. Don't you like what Starbucks does? Here is the 12/3/10 issue of Retail Experience in the News... recapping the latest articles and links shared on Twitter with the #retailexp hashtag this past week. Consider this the Economy/Consumer edition given how many articles I came across about the state of the marketplace! How were your Black Friday/Cyber Monday? Per NYT, online sales remain strong http://nyti.ms/hCLYAg Good #retailexp news? Good info here: 5 major trends in consumer spending from Amex http://bit.ly/hVLcDw #retailexp - Agree? How local differentiates an apparel manufacturer http://bit.ly/g48AlQ How do U use 'local' to differentiate yr #Retailexp? Welcome back from the Thanksgiving Holiday weekend. Here follows the November 2010 update from Simple Marketing Now with posts categorized into Social Media Marketing Resources and Simple Marketing News. 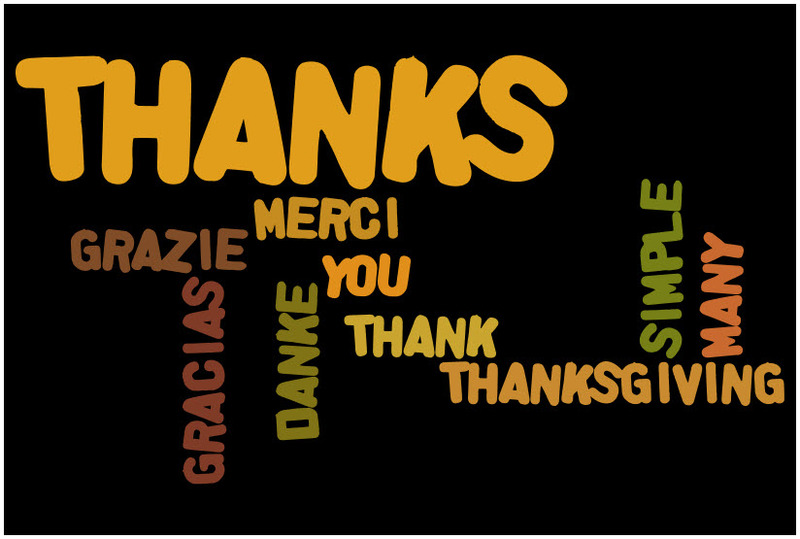 I hope you all spent a lovely Holiday last week - for those of you in the U.S.: Happy Thanksgiving 2010! Did you have a chance to check out my latest eNewsletter? 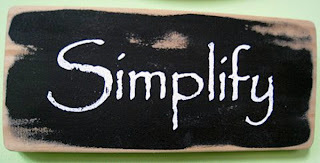 Here is the link: Simple News & Insights - Fall 2010. If you like what you see, perhaps you would consider subscribing? 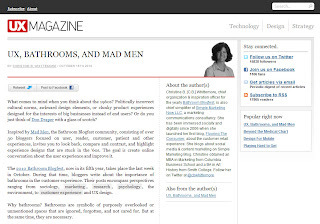 Perhaps you'll find interesting my Bathroom Blogfest Social Media Marketing Analysis: Why Participate? Imagine social tools being about sharing culture rather than for pushing deals. That's how Zappos uses them - be they the telephone, Twitter, Facebook, blogs, videos and more [see Zappos gets savvy with social media]. 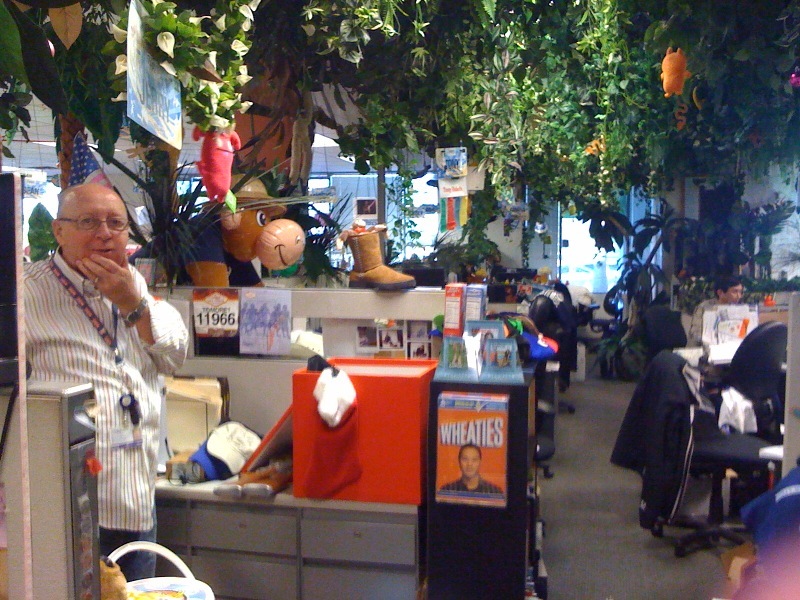 Zappos is intensely passionate and single-minded about its culture. In fact, Zappos places a premium on employee fit with its unique customer service focused culture. "Our whole belief is that if we get the culture right, then most of the other stuff, like delivering great customer service or building a long term enduring brand, will happen naturally on its own," says CEO Tony Hsieh in 840 million reasons to celebrate. 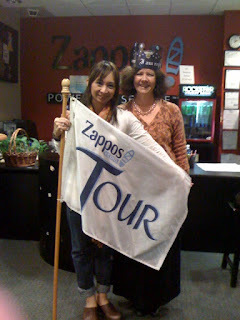 What's most intriguing is how Zappos shares its culture, using social tools. Rather than use then as selling tools, Zappos deliberately uses them to "...connect on a more personal level with both employees and customers. It gives people a glimpse into our company culture, which is ultimately what our brand is all about," explains Hsieh. Mind you, this is the company that considers the telephone to be the best social media; "it's ... easier to build a personal and emotional connection with someone remotely than by email," says Hsieh in Happy @ Zappos. In Delivering Happiness the Zappos Way, Hsieh advises would-be presenters to not sell a product, but rather to inspire the audience because "ultimately, it causes people to be more attached to the brand and the company. You'd much rather support a company that inspires you than one that doesn't." As a result,as described in the March 2, 2009 issue of PRWeek in an article titled "A perfect fit", "all staffers are introduced to Twitter in their training, and more than 400 are active on the site, interacting with each other and customers." The number is closer to 500 now and Zappos has integrated all of the Twitter streams into a single site [see below]. Hsieh explains in the article "the best way to provide customer service is to form relationships - with each other and with customers." In At Zappos, Culture Pays, you get a feel for how Zappos "corporate culture is more than a set of values, and it is maintained by a complex web of human interactions. At Zappos the liberal use of social media facilitates the network that links employees with one another and with the company's customers..."
How many of you operate the same way? As this Mashable interview with Hsieh titled Zappos CEO on How to Deliver Happiness with Social Media asks "Many companies view staff time spent on social media as a waste, and some are even blocking these sites. What is Zappos' approach to this? Do you think time on social media sites can increase well-being of staff or is this best left to their personal time?" Hsieh responds, "we don't have a specific social media policy. In fact, we try to avoid policies about anything as much as possible, because usually policies are used to address the 1% of people causing a problem at the expense and inconvenience of the 99% of people that are not. Our philosophy is to hire the right employees (employees whose personal values match our corporate core values), make sure everyone understands the long-terms vision, provide ongoing training and development opportunities, and then trust our employees to do the right thing." Or, you might consider Zappos' bootcamp - see Paid Content Profile: How Zappos became expert on customer service culture and a publisher. 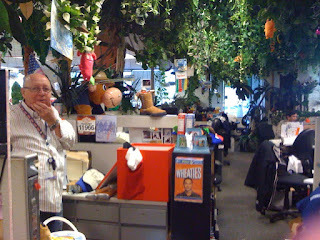 Regardless, would you let me know how Zappos' example inspires you to use social to share your culture? "Minding the customer" by Janet Groeber from DDI Magazine's March 2010 issue with perspectives from Herb Sorenson, Paco Underhill, Vince Guzzi and Marcie Merriman has inspired two posts so far: The Changing Customer Retail Experience. Data Vs. Insights and Reinventing Retail. This post explores active vs. passive retailing and improving the customer experience. I'm particularly taken with the notion of "active" retailing which implies thoughtful consideration of customers and how products meets their needs. Think Trader Joe's deliberately adhering to a set number of SKUs while encouraging new product introductions. Active retailing also opens the door to the possibility of meaningful relationships. Lulu lemon athletica comes to mind. Underhill: "Retailers can either super-size or specialize - become all things to all people and manage it that way, or focus on who they want to serve." "Over the past six months, we've found an astonishing number of customers - particularly those shopping for durable goods - pre-shop a Web site before arriving at the store. That's a fundamental reordering of how retailers take products to market and a completely different way of connecting." Merriman: "Planned interruptions in the shoppers' path, ... in-store displays and disruption packaging, are current tactics to stop shoppers and make them pick up something they hadn't planned to purchase. Often, these tactics result in more mind clutter and a less enjoyable shopping experience..."
Guzzi: "The physical environment is still the theater to stimulate ideas... Shoppers are in constant search of being surprised and delighted. Beyond this, understanding underlying customers needs has inspired retailers to incorporate new service offerings..."
Sorenson: "It is really quite simple, moving from the passive warehouse mentality to actually selling to shoppers, not just waiting for them to buy... What do shoppers want to buy? ... That's what a shopper-centric retailer will focus on selling." What's your take on active vs. passive retailing? How would you apply it to your business? How do you see it improving the customer experience? Here is the 11/19/10 issue of Retail Experience in the News... recapping the latest articles and links shared on Twitter with the #retailexp hashtag this past week. What makes a retail destination? http://bit.ly/ajKzbA #retailexp fr my archives! Happy Friday! Here is the 11/12/10 issue of Retail Experience in the News... recapping the latest articles and links shared on Twitter with the #retailexp hashtag this past week. By the way, the article about Linda Fargo reminds me that Holiday store windows in NYC are right around the corner... What do you have planned for your store windows? 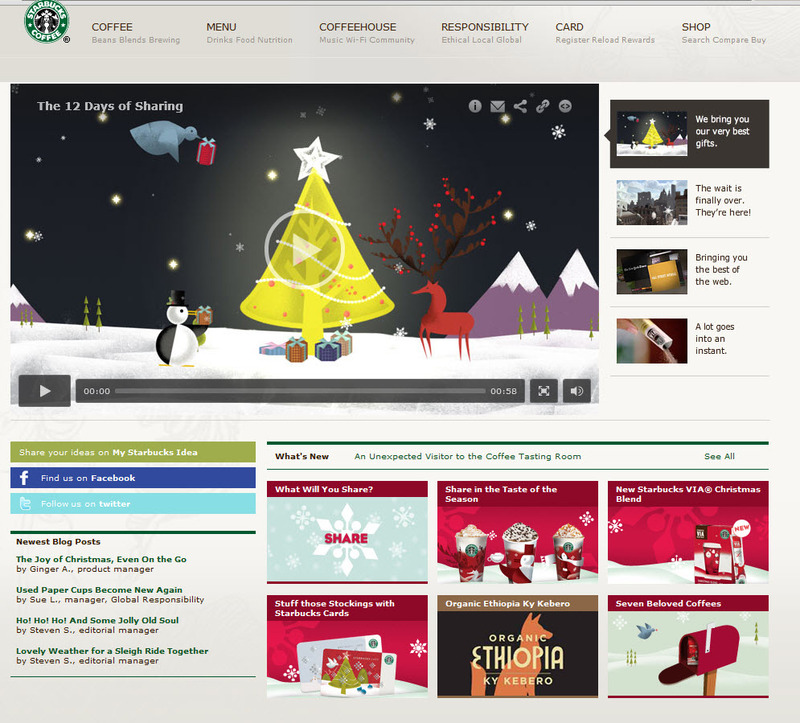 What's hot for this retail season/tech trends http://bit.ly/dlZ6tJ #retailexp Searchable store maps 4 smartphones: Yes! How is your business doing? What are you having success with? Thanks for asking Christine. I have come to accept/embrace several ideas. 1. Volatility is the new normal. As much as we would like more even business, volatility both motivates a person to be more careful and humble. It’s not going away anytime soon. Think like a farmer. 2. Deleverage where it counts. Figure what makes a difference to our customers. Everything else doesn’t matter. 3. I cannot expense my way to success. I need to take more calculated risks and make sure I have an exit strategy. 4. I must hire/retain employees who embrace the new age of conversation both analog and digital. 5. Our company must consistently under promise and over deliver. The old saying goes something like this: “how’s business?”... “ I’m still here.” Our company just celebrated our 32nd Anniversary. Congratulations, Dennis, and thank you for sharing these ideas. I'm particularly struck with the "think like a farmer" comment combined with customer focus. I expect that careful, humble and under promise/over deliver make for a memorable retail customer experience. How about you? How is your business going? What's your business wisdom? What are you having success with? We'd love to hear and learn from you. Time for the 11/5/10 issue of Retail Experience in the News... recapping the latest articles and links shared on Twitter with the #retailexp hashtag this past week. I have a special request. Would you mind taking a minute to fill out this survey titled You and Your Computer? It's for my husband, Ted Whittemore, author of Working Computers. He wants to know more about you and your computer, what worries you about your computer and what matters to you in your computer. Your responses will help him develop content for his blog, Working Computers. It may even offer you valuable advice on how to make better use of your computer! Subscribers, please click on Working Computers Survey: You & Your Computer - Perfect Together! to access the survey. And, if you'd like to subscribe to Working Computers, please don't be shy! I think the world of Ted Whittemore and am extremely grateful for his professional computer advice. Not that I'm biased in any way ;-). Happy Halloween to you all! I hope you enjoyed a ghost or goblin or two over the weekend. Here follows the October 2010 update from Simple Marketing Now with posts categorized into Social Media Marketing Resources and Simple Marketing News. The biggest news for October has to do with Bathroom Blogfest 2010: Press Release: Bathroom Blogfest 2010. This was the plan for the week: Bathroom Blogfest 2010 Begins. Immediately before Bathroom Blogfest began, I participated in Blog Action Day: Water & AOC3. Other exciting news, Simple Marketing Blog is now listed in eCairn's Top 150 Social Media Marketing Blogs. 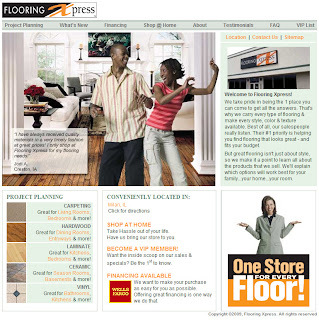 You will enjoy the wisdom that Nufloors retailer Cynthia Dean shares in Connecting With Customers: Nufloors Advice. I've been contributing to Content Marketing Institute's crowd-sourced series on engaging content. Although I focus on my contribution in these posts, I think you'll want to read the original posts, too. Finally, here are the latest links to articles and news about practical marketing on Twitter, coded #PracticalMktr: Practical Simple Marketing In The News 10/5/10. Here is the 10/22/10 issue of Retail Experience in the News... recapping the latest articles and links shared on Twitter with the #retailexp hashtag this past week. My personal favorite is the AdAge article about the ramifications of the decline in the US car culture. I refer to those ideas repeatedly as I think about the consumer of the future. Also interesting are the global/local considerations. Let me know what resonates most with you. By the way, since Bathroom Blogfest 2010 will be happening next week, I'll be holding off on Retail Experience in the News... which means lots more goodies for you when things resume in early November! RT @rnadworny: The Value of an Existing Customer http://bit.ly/cCRnGZ from @Flowtown CB: Excellent info for #retailexp! I've alluded to this momentous event. Now, it's time to share some details with you! Bathroom Blogfest 2010 is happening next week and you can learn more about it on UX Magazine! That's right. 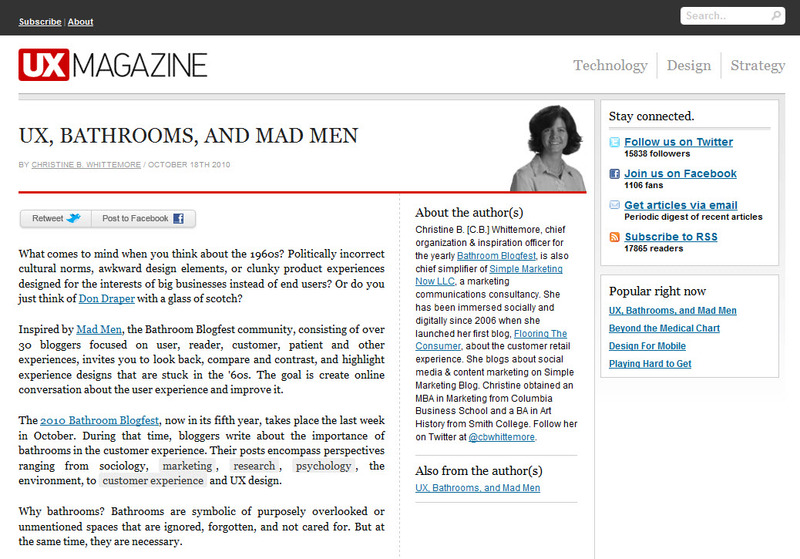 Check out UX, Bathrooms, and Mad Men. It describes the details about this year's Bathroom Blogfest. More specifically, from October 25 through 29, 2010, with marvelous perspectives from 33 bloggers writing 41 blogs. Details below. The theme, "Stuck in the 60s?" is Mad Men inspired. Overall, it's guaranteed to be an eye-opening blast and I hope you'll join in on the fun. Read the official press release!